Temperatures in Japan have reached 41.1C, a new record for the country, amid a deadly heatwave that has claimed dozens of lives. The temperature was recorded in the city of Kumagaya, a city northwest of Tokyo, beating a previous high of 41C in the western prefecture of Kochi in August 2013, according to the Japan Meteorological Agency. Records go back to varying dates for different cities, with data for Kumagaya starting in 1896. Authorities are warning people to stay indoors and use air conditioning where possible, with new deaths being reported almost every day for the last week. The heatwave has set in not just over wide swaths of Japan, but also in South Korea, where the country's highest-ever morning low was recorded on Monday. The mercury sat at 31C at 6.45am in the city of Gangneung, according to the Yonhap news agency. 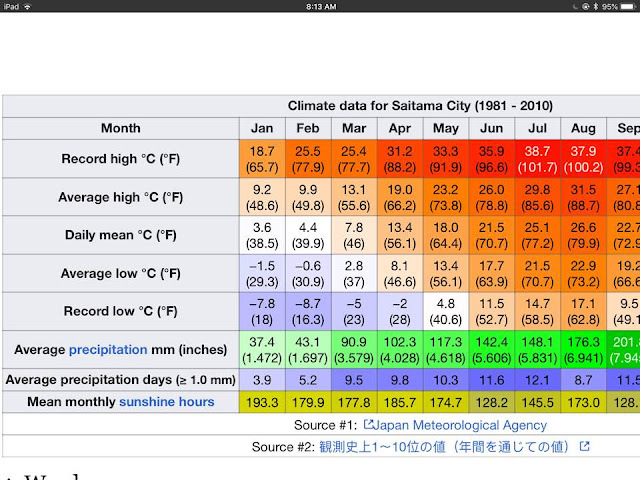 Forecasters said they expected highs on Monday of 39C in Nagoya and 37C in Tokyo. Hundreds have been taken to hospital for treatment for heat stroke symptoms, in addition to a death toll of at least two dozen. Last week, the heatwave had many residents in Tokyo questioning the wisdom of staging the 2020 Olympics in July and August. The 2020 Olympics will run from 24 July to 9 August, when temperatures in central Tokyo can exceed 35C. Tokyo's Application File to host the 2020 Games reads: "The pleasant weather conditions at this time of year will be ideal for athletes." But anyone who has spent a summer in Tokyo knows that is not necessarily the case. In 1964, the Olympics in Tokyo were held in October, mostly to avoid the scorching heat, but that was before the Olympics became big business and TV contracts determined schedules. Organisers are doing what they can but there is only so much that can be done to beat the heat. During a visit to Tokyo last week, John Coates, the head of an International Olympic Committee inspection team, acknowledged the heat will be a huge challenge for organisers. "We are mindful that we do have to prepare for extreme heat," he said at a news conference. "You're not the first country to host the games in extreme heat. It's a natural consequence of being in July and August." 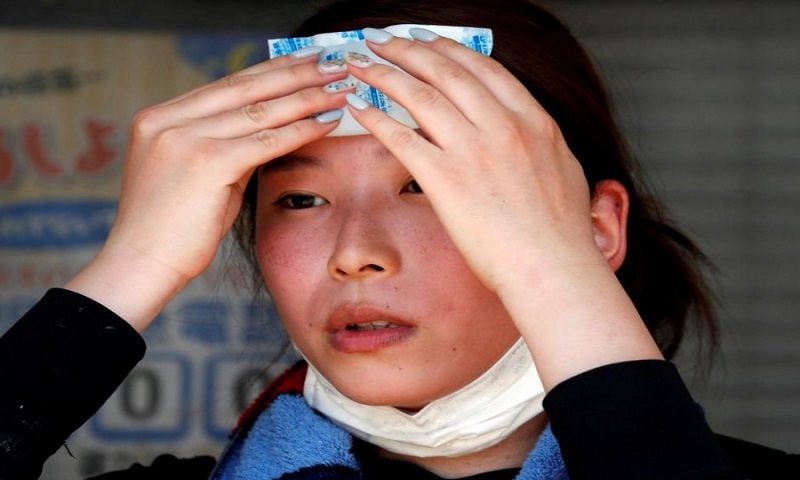 Temperatures in Japan have reached 41.1C, a new record for the country, amid a deadly heat wave that has claimed dozens of lives. The temperature was recorded in the city of Kumagaya, a city northwest of Tokyo, beating a previous high of 41C in the western prefecture of Kochi in August 2013, according to the Japan Meteorological Agency. 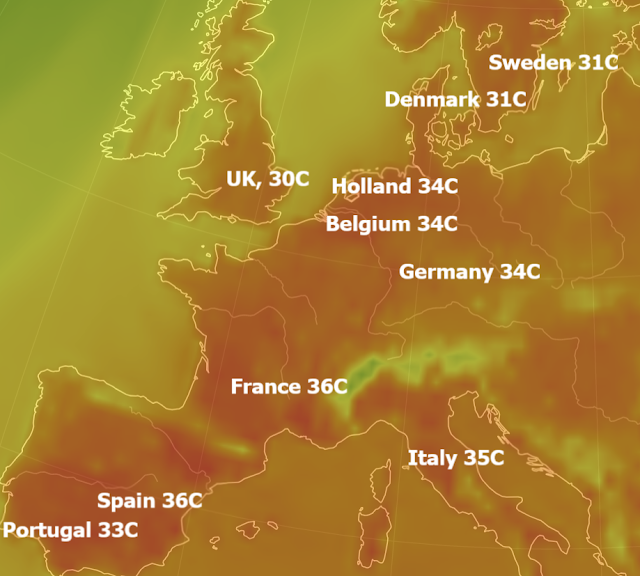 Meanwhile, Europe is expecting it's hottest week in many years as the heat wave intensifies there. In many areas in Europe and the UK, no significant rain has fallen since the beginning of May, while the Met Office has issued warnings for people to stay out the sun this week as temperatures are expected to rise to around 35 deg C (95 deg F). Here in Holland, the Dutch government have issued heat warnings for the whole week as the mercury is set to rise well above 30 deg C, in my own town of Alkmaar we have endured more than 60 days without rain. The heatwave in Sweden is getting so bad that the country has now sent out official warnings about "extremely high temperatures" in several areas, including Stockholm and Uppsala. Sweden's national weather agency SMHI on Sunday issued a class-two alert for "extremely high temperatures" (the most serious temperature warning) in counties in central parts of the country: Orebro, Västmanland, Sodermanland, Uppsala and Stockholm. The warning means that temperatures are expected to reach 30C or more five days in a row.